is devoted to pictures of sukkahs. submit your 2014 sukkahs. our 2013 pictures are below(double click to enlarge) or at this address if you have an iphone. One of them was featured in the Boston Jewish Advocate on September 20, 2013 "And you shall dwell in Sukkahs for seven days." This year we featured sukkahs from Sharon, Easton, Mansfield, Natick and Lexington, Massachustts, Skokie, Illinois, Houston, Texas in the USA, Richmond Hill, Ontario, Canada, and Kiryat Yovel, Jersalem and Ramat Raziel, Israel. This includes the welcoming sukkah, the open sukkah, the sukkah in a swimming pool, and the sukkah on a roof. We also added a new page about the Holiday of Sukkot. Johannesburg, SA, and Collegeville, PA. . A special feature from 2012 was a sukkah before and after it blew down- everyone made it out! or if they didn't no one is telling. 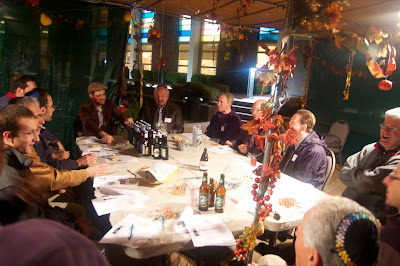 The 2011 show includes a sukkah that resembles Joseph's coat of many colors and Scotch in the Sukkah with the Men's club at Temple Israel Natick, MA. (Does it look like Scotch?) Talk about enjoying the holiday! Click on pix and slide shows to enlarge! Photos will look best at full screen/slide show with time set to 6 seconds; adjust at bottom of slide show page. We are also looking for nominations of the best, worst, and weirdest Sukkah videos. Send a link with your comment, and we will embed on this site. See examples on our sukkah video page. Read about the Sukkah Family. And if you have adventures of the Sukkah Family to share, let us know. special treat: a few pictures of a Sukkah growing in Brooklyn, NY...and this one looks like it came right out of the ground. What makes a sukkah a sukkah? Neither the walls nor the roof. It is you. The biblical commandment does not say to build a sukkah, it says "you shall dwell in Sukkahs..."
with sukkahsoftheworld.org Please note a special treat in 2010, a sukkah from Duxbury, MA. Look at our photo archives for pictures from 2005-2009 and a video with benching of lulav and an etrog and an etrog box gallery. "Ufros Alenu Sukkat Shlomacha Spread over us the tabernacle of thy peace" What a wonderful description of our relationship with G-d, and of the function of the Jewish holidays! The holidays and the sukkah let us participate in that peace. Thanks to all who welcomed me into their sukkahs, and supplied photographs. I had a blast going from house to house. Sunday was sukkah open house day, and I usually knew the guests if not the owners. If you look carefully you will see me with my hands in the cookie jar! Like what you see? For comments or submissions see our contact information.